Earthquakes kill approximately 8,000 people each year and have caused an estimated 13 million deaths in the past 4,000 years. The moment magnitude scale (MMS) replaced the 1930s-era Richter scale in the 1970s as the method of measuring the size of earthquakes in terms of energy released. In Japan mythology, a giant catfish called Namazu is responsible for earthquakes. The Indian Ocean earthquake in 2004 generated enough energy to power all the homes and businesses in the United States for three days. Aftershocks occur because the displaced fault line and crust are adjusting to the effects of the main earthquake. Larger earthquakes can have aftershocks that last for years. Shock waves produced by Rayleigh waves or waves that roll through the Earth’s surface—in contrast to side-to-side waves or Love waves—can travel far enough upward to cause a disturbance in the ionosphere. The ionosphere is the layer of Earth’s atmosphere about 50-300 miles (80-480 km) above Earth’s surface. Parkfield, California, is known as “The Earthquake Capital of the World” and has a bridge that spans two tectonic plates. Earthquakes are mostly caused by geological faults, but they can also be caused by landslides, nuclear testing, mine tests, and volcanic activity. The “focus” or “hypocenter” is the earthquake’s initial point of rupture. Its “epicenter” is the point at ground level above the hypocenter. More earthquakes happen in the Northern Hemisphere than in the Southern Hemisphere. In Hindu mythology, Earth is held in place by eight gigantic elephants, all balanced on the back of turtle, which itself stands on the coils of a snake. If any of these animals shift or move, an earthquake occurs. The worst avalanche triggered by an earthquake occurred in Peru in 1070. A 250-foot (850-meter) wave of ice, mud, and rock fell down the mountain in Huascaran at 250 miles (400 km) per hour. It carried away entire villages and killed more than 18,000 people. The world’s worst landslide started by an earthquake occurred in 1920 in the Kansu province in China. The landslide killed about 200,000 people. The highest tsunami caused by an earthquake happened in Japan in 1771. A tsunami 278 feet (85 meters) high struck Ishigaki Island. The shape of a pagoda is known for resisting damage from earthquakes. Tectonic plates move less than 3 inches (17 cm) per year. However, a tectonic plate movement of just 20 cm is enough to set off a major earthquake, such as the 6.9 Kobe earthquake in 1995. Scientists developed the theory of plate tectonics in the mid-twentieth century. There are four types of faults: normal, reverse, thrust, and strike-up. A quake is considered major when it registers more than 7.0 on the moment magnitude scale. A magnitude of 3.0 or lower is nearly imperceptible. The 1906 earthquake in California was before the Richter scale, but scientists estimate it would rank as a 7.8. As much as 90% of the damage in San Francisco was from fires caused by cracked gas pipes. San Francisco burned for three days and nights. The 1906 California earthquake was one of the first major disasters to be recorded by photography. Nearly 2,000 years ago, a Chinese astronomer named Zhang Heng (A.D. 78-139) invented the world’s first earthquake detector. It could detect earthquakes more than 370 miles (600 km) away. Nearly 80% of Earth’s largest earthquakes occur near the “Ring of Fire,” which is a horseshoe-shaped region in the Pacific Ocean where many tectonic plates meet. The second-most earthquake-prone area is a region called the Alpide Belt, which includes countries such as Turkey, India, and Pakistan. Earthquakes can set off volcanoes, as was the case in the 1980 Mount St. Helens eruption and the Mount Etna eruption in 2002. An earthquake in A.D. 1201 in the eastern Mediterranean is labeled the worst earthquake in history and claimed an estimated one million lives. The 853-foot (260-meter) high Transamerica Pyramid in San Francisco has been designed to withstand strong earthquakes. Earthquakes occur only in the Earth’s crust. Deep earthquakes originate in crust that is sliding down beneath another tectonic plate. The most devastating earthquakes are those that are strong and shallow with the focus point less than 20 miles (32 km) underground and that occur in highly populated areas. Scientists think that animals may sense weak tremors before a quake. Other scientists think that animals may sense electrical signals set off by the shifting of underground rocks. The ancient Greeks believed that earthquakes were caused by winds rushing out from caves inside Earth. The 2004 Indian Ocean earthquake lasted nearly 10 minutes—the longest on record. Englishman John Milne invented the seismograph in 1880. American scientist Charles Richter invented the Richter scale in 1935. There are about 1,300,000 earthquakes per year (two per day) with magnitudes of 2.9 or lower. Approximately one earthquake with a magnitude of 8.0 or higher occurs per year. The largest earthquake in the U.S. on record was a 9.2 quake that occurred in Alaska in 1964. The speed of the fastest seismic wave is 225 miles (360 kilometers) per hour. An earthquake can release hundreds times more energy than the nuclear bomb that was dropped on Hiroshima in Japan in 1945. Before an earthquake, ponds and canals may give off a strange smell. This is caused by the release of gases underground. The temperature of ground water can also become warmer. An earthquake under the ocean can cause a tsunami, which travels outward in all directions up to 600 miles (970 km) per hour, the speed of a jet. When the tsunami reaches the shoreline, it suddenly rolls up to heights of over 100 feet (30 meters) causing massive destruction. An earthquake on the moon is called a moonquake. Moonquakes are normally weaker than earthquakes. Though the ground moved for only about 20 seconds during the 1995 Kobe, Japan, earthquake, more than 5,000 people were killed, 300,000 people were left homeless, and more than 100,000 buildings were destroyed. The earthquake in Lisbon, Portugal, in 1775 caused waves on the surface of Scotland’s Loch Ness, more than 1,240 miles (2,000 km) away. The 1964 Alaska 9.2 quake lasted four minutes and dropped streets 20 feet (6 meters) below normal. It caused flooding on the coast of Hawaii, more than 3,100 miles away. The first recorded earthquake in California was in 1769 by Gaspar de Portola, an explorer and Spanish military officer. The San Andreas Fault is moving about 2 inches a year, about the same rate fingernails grow. At this rate, San Francisco and Los Angeles will be next to each other in 15 million years. The most earthquake-prone state is Alaska. The earliest recorded earthquake is from 1831 B.C. in the Shandong province in China. Aristotle was the first to note that soft ground shakes more than hard ground. Japan is one of the most earthquake-prone nations in the world. 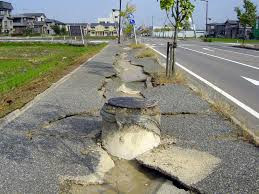 Thousands of earthquakes occur in Japan every year, but most of them are very weak. In 2006, geologists found three new faults in northern California. The faults run under small towns and vineyards in Mendocino County. The San Andres is one of the longest fault zones in the world. It is a strike-slip fault and runs over 800 miles (1,280 km) from San Francisco through southern California to Mexico. The San Andres fault is not just one fault but it is actually made up of many faults. The 9.0 earthquake that struck Japan March 11, 20110 was the worst earthquake in Japan’s history. It created a tsunami with waves as high as 30 feet (10 meters) and severely damaged nuclear power plants. Japan’s 9.0 earthquake in 2011 not only moved the island closer to the United States, it also shifted the planet’s axis by 6.5 inches. The devastating 2011 earthquake in Japan created a massive 186-mile long and 93 mile wide rift 15 miles under the ocean. Because earthquake-prone Japan had placed high-tech sensors around the country after its 1995 quake, Japan’s 2011 earthquake is the best-recorded earthquake in history.